The Obama administration’s Dietary Guidelines for Americans, released earlier this month, are supposed to represent the best scientific judgments on what people need to do to stay healthy. Instead, the 2016 edition of the guidelines, like those before it, are confusing to consumers and influenced by the $1 trillion-a-year food industry. The consequences of watering down the guidelines are serious and far-reaching. This document, updated every five years, informs federal food policy and helps determine what’s in school lunches. It influences how companies label and advertise food and the advice health care professionals give patients. It arguably bears some of the blame for the epidemic of obesity and weight-related disorders such as diabetes, cancer, and heart disease. Astonishingly, about half of all Americans have one or more of these preventable chronic diseases linked to poor diet quality and physical inactivity. Yet the new dietary guidelines for Americans offers them confusing advice. suggested taxing sugary drinks and other junk food. Does not clearly call on people to eat less meat, both to protect their health and to reduce the harm that meat production does to the environment. Does not adequately detail the risk of eating fish high in mercury, a heavy metal toxic to the brain and nervous system, especially for children and pregnant women. Buries advice to drink more water and cut down on soft drinks and sugar-sweetened beverages -- even though sugary beverages are the main source of added sugars in the American diet. Marion Nestle, a nutrition professor at New York University and a leading food politics expert, calls the guidelines "a win for the meat, sugary drink, processed, and junk food industries." We at EWG agree. We believe that Americans need clear, unambiguous guidelines, not a document that tip-toes around the hard truth. People need solid guidance about how to eat a diet that is both healthy for them and their families and for the planet. The overwhelming majority of Americans don’t eat enough vegetables and fruits. People can’t always find or afford organic food. EWG’s Shopper’s Guide to Pesticides in Produce is an easy-to-use list of conventionally grown fruits and vegetables that tend to test low for pesticide residues. EWG’s Dirty Dozen list details conventional produce that routinely test high for pesticides. EWG advises shoppers to buy organic versions of those items when possible. Red and processed meats are believed to cause cancer and heart disease, and their production is bad for the environment. The American Institute for Cancer Research recommends eating no more than 18 ounces of red meats weekly – the equivalent of six hamburgers – and avoiding processed meats. 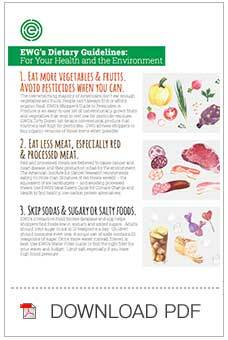 Use EWG’s Meat Eater’s Guide for Climate Change and Health to find healthy, low-carbon protein alternatives. EWG’s interactive Food Scores database and app helps shoppers find foods low in sodium and added sugars. Adults should limit sugar to six to 12 teaspoons a day. Children should consume even less. A single canned soft drink contains 10 teaspoons of sugar. Drink more water instead, filtered is best. Use EWG’s Water Filter Guide to find the right filter for your water and budget. Limit salt, especially if you have high blood pressure. Many Americans would benefit from eating more seafood rich in healthy omega-3 fatty acids, which can lower blood cholesterol levels and reduce the risk of heart disease. Pregnant women and children should steer clear of seafood with high mercury levels and should limit consumption of canned tuna. Use EWG’s Good Seafood Guide to find fish and seafood richest in omega-3s, lowest in mercury contamination and sustainably caught. The federal Food and Drug Administration allows more than 10,000 chemical additives in food. Some of these substances are linked to serious disorders; others haven’t been studied adequately. EWG’s Dirty Dozen Guide to Food Additives describes some of the most worrisome additives and gives tips on how you can avoid them. EWG’s interactive Food Scores database can steer you away from the more than 22,000 foods that contain artery-clogging trans fat, a prime culprit in the nation's epidemic of heart disease.